I met a woman named Julia Driscoll who had quite the inventory of items made new again from old/vintage items. Her Etsy store is called THE VINTAGE VAIL. Her store tagline is “Vintage Finds Embellished to New Life”. Love it! 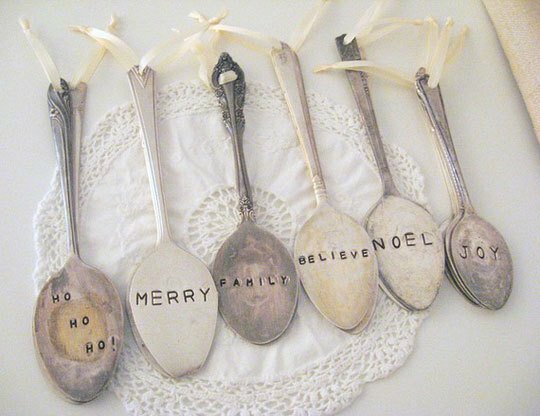 She had vintage silver utensils that she engraved “quotes” on. She engraved/stamped each letter by hand. 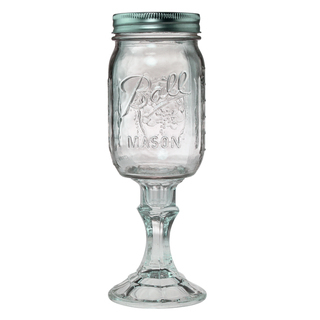 She also had what is called “redneck wine glasses“. Here are some pics of what they look like. Really neat stuff! I am so excited about this DIY project. Two of my favorite repurposed items are chairs and lamps. 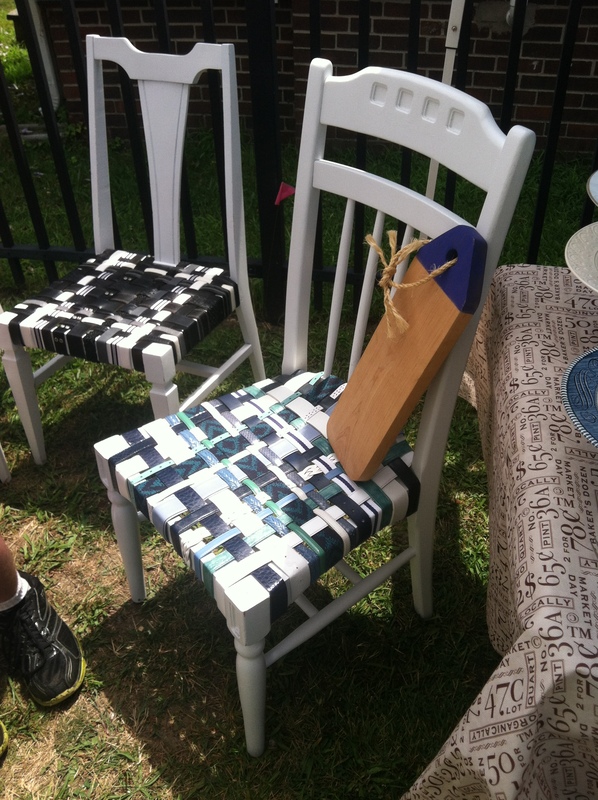 I can always find a chair in someone’s trash, a yard sale or a flea market. It is one of the most thrown away items that I find and I have no idea why! 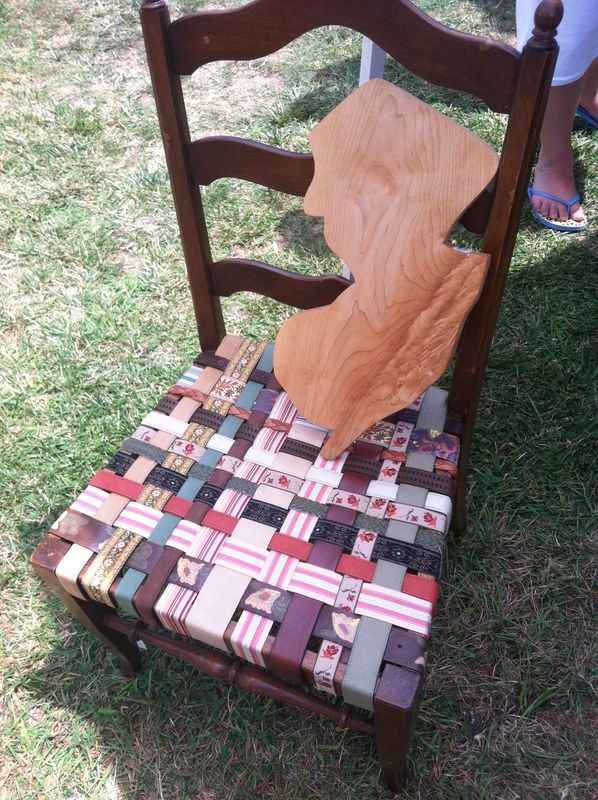 You can do so many things with an old chair. So check this out…you can always find old vintage belts in thrift shops, I see them all the time. Julia weaves those belts to make a new seat for an old chair that has been either repainted or restored in some way. These are actual pictures of Julia’s chairs that she allowed me to take. I was in love with the blue on white one and wish I had room in my car to drive it three hours back home. These truly are beautiful and unique. Finally, craigslist is a great place to find free/cheap chairs and belts! Previous postNeed a unique idea for that old picnic table?